Lisa Daly, MA, is a professor of early childhood education at Folsom Lake College in Folsom, California. 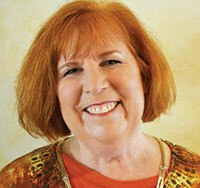 She has over thirty years of experience as an early childhood teacher, director, and educator. She has served on community and Association for the Education of Young Children (AEYC) boards, including the statewide Child Development Training Consortium advisory board. She is passionate about creative arts and has directed art programs for thousands of children at community family events and camps. She has also presented numerous workshops for educators on art, storytelling, language and literacy, sensory experiences, and music and movement. 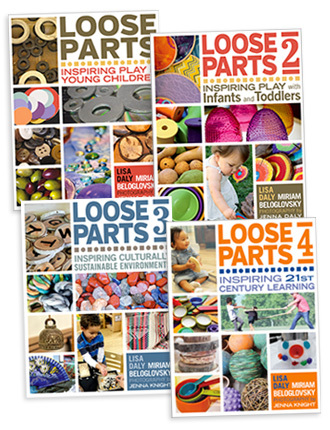 Lisa is the coauthor of the popular award-winning Loose Parts series and Early Learning Theories Made Visible. In the newest installment of the popular, award-winning Loose Parts series, Lisa Daly and Miriam Beloglovsky focus on family engagement and competency building. Age focus 3–8. Softbound. 264 pages. The next installment for the award-winning Loose Parts series offers inspiration and guidance on creating culturally sensitive and culturally sustainable early childhood environments. With the help of over 400 full-color photos, this book shows readers how to use their environment to promote a sense of wonder, curiosity, and joy, and allow children to explore their identity. Peer-reviewed by a team from diverse backgrounds Loose Parts 3 includes a note to educators on the discoveries made during the review process. 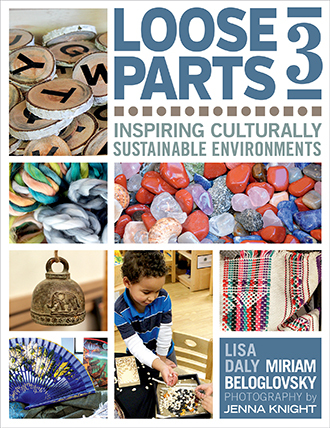 Includes one copy of Loose Parts: Inspiring Play in Young Children, Loose Parts 2: Inspiring Play with Infants and Toddlers and Loose Parts 3: Inspiring Culturally Sustainable Environments.